I attended a talk earlier this week ("How to Read a Product Label") that focused on the ingredients (read: chemicals) present in our personal health care products. The discussion was sponsored by the Children's Environmental Health Center (CEHC) at Mount Sinai Medical Center. The speaker was Sarah Evans, PhD, a fellow in pediatric environmental health at CEHC. Don't run for the hills just yet; it's not all bad. Mostly, but not all. It's baffling to hear that, in the United States, there are no government requirements for the testing of chemicals that go into cosmetics and personal health care products and very few regulations for the labeling of these products, especially when, according to Evans, "even minute amounts of a chemical can have negative effects; think a grain of salt in an Olympic-size swimming pool." These chemicals do get into our bodies (blood and urine samples prove this) and avoidance is paramount, especially for small children and pregnant women. Children and fetuses are uniquely vulnerable to exposure due to their immature metabolisms and processing systems. In addition, the predilection of hand-to-mouth exposure among babies and toddlers increases ingestion rates. "The physical environment in which American children live, learn and play in has changed dramatically over the past 50 years. Since World War II, more than 80,000 new synthetic chemicals have been developed and are used in millions of consumer products, ranging from foods and food packaging to clothing, building materials, cleaning products, cosmetics, toys, and baby bottles." Looking for better personal care products? Visit the Environmental Working Group's Skin Deep database, which is a great resource. 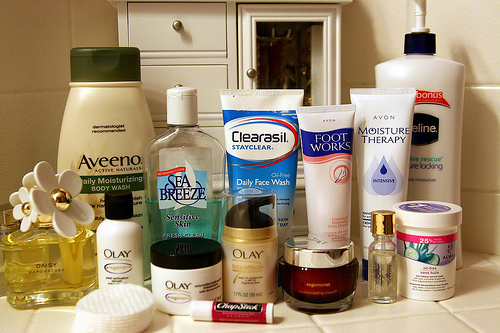 Also, click here to see the personal care products I use, which could help you get started. Rob, what are your thoughts on flouride in toothpaste? Hope all is well. I use fluoride-free toothpaste and would drink fluoride-free water if I could, but New York City has been fluoridating its water since 1964. (http://www.nyc.gov/html/dep/pdf/wsstat00b.pdf). I've read a lot about fluoride (both sides of the argument) and, personally, feel more comfortable not ingesting it when possible. Great concise info Rob. I wanted something 100% good, not just a some good ingredients mixed w/the same old synthetics. Who knew, I almost compromised until I found my A+ products. Little did I know I had to use the terms "non toxic" or "no harmful chemicals". I am now in personal care product heaven, and America can be too: www.AvaAndersonNonToxic.com/ArelyPosz Enjoy! If I Were President of the United States . . .